No, I am not talking about Elizabeth Berkeley (even though she is one of the Lettuce Ladies). 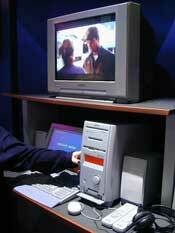 No, I am talking about 3 of the coolest things I saw at Comdex 2000.
eWeek already beat me to the punch with photos of this in their print version but the Eupa Interactive Appliances monitors and PC's were the coolest. They are primarily a kitchen appliance manufacturer and it shows. Here are a few photos, just click for a larger version of each. HP released their first digital camera with an SLR style viewfinder. HP has always been a favorite of mine for printers and scanners but their cameras were always a bit lame. The Photosmart 912 is their flagship in a new, very cool line of cameras. All of the features my Nikon 800 needs and more. If you want to be my secret Santa this year. I will happily send you a shipping address. It's a Sony VAIO computer with built in DVD player, CD burner, MiniDisc, Memory Stick, 1394 ports, volume control, jog shuttle, led readout (Media Bar), remote control and AV in/out. Whew! The marketing rep said currently it is only available in Japan and retails for ~$3000. I am guessing the dollar is a bit stronger than the yen right now.